We the People of the United States, in Order to form a more selfish Union, establish Social Justice, insure domestic Strife, provide for the common anarchy, promote the general Welfare Society, and secure the Curse of Tyranny to ourselves and our Posterity, do DISMISS and DESPISE any PERSPECTIVE but OUR OWN for the Disunited States of America. Last week, while Americans saddled up to fight a civil war over statues erected to honor combatants of the Civil War, billionaire Paul Allen sent out a tweet announcing his expedition had located the wreck of the USS Indianapolis. Ironically, most of the people fighting each other over the nation’s history, even if they heard the news, would have had no clue how significant that announcement was. On July 26, 1945, the Portland-class heavy cruiser USS Indianapolis (CA-35) delivered Little Boy, the first operational atomic bomb ever produced, to Tinian, an island in the Philippine Sea. Almost immediately after her cargo was unloaded, Indianapolis was ordered to Leyte Gulf to assist with preparations for the invasion of Japan. Most of the crew would never know their mission made an invasion unnecessary. Halfway to her destination, two of the six torpedoes fired by the Japanese submarine I-58 struck Indianapolis. One blew off her bow. The other ignited a fuel tank and a magazine, tearing the ship in half. It took only twelve minutes for the sea to claim her, along with 300 officers and enlisted men. The date was July 30, 1945. Japan announced her unconditional surrender just over two weeks later, on August 15. Even though the ship sank too quickly for life rafts to be deployed, most of the 900 plus sailors who made it into the water alive had their life vests. They were without food and water, but expected to be rescued within a day or two, if not a few hours. They couldn’t know that a miscommunication, combined with faulty Navy guidelines, kept anyone from realizing they were late reporting in. No alarms were sounded. No search parties were organized. No one came looking. When the sun rose that morning, the survivors realized they weren’t alone in their patch of ocean. Sharks attacked them for the next four days, feeding at will. The men spent every hour of daylight in the sun, finding relief only when darkness fell. The dark couldn’t relieve their thirst, however, any more than sea water could. Finally, Lt (jg) Wilber Gwinn, a bomber pilot, spotted the survivors while conducting an anti-submarine patrol. He radioed in a report of “…many men in the water.” Since no one suspected Indianapolis had been sunk, a single seaplane, piloted by Lt. Adrian Marks, was sent to investigate and assist, if needed. Standing orders prevented Lt. Marks from landing under any circumstances. That might have seemed heartless, but the orders made sense because the PBY wasn’t built to handle open-sea landings. After circling for several hours and dropping life rafts and barrels of fresh water for the men, Lt. Marks realized they were being repeatedly attacked by sharks. Still not knowing what ship the men belonged to, the lieutenant disregarded his orders and set the seaplane down. He and his crew managed to haul fifty-six men to safety, even tying them onto the wings with parachute cord when the fuselage was full. Many more men were still in the water, however. Lt. Marks radioed for immediate help when discovered he had found what was left of the Indianapolis’s crew, and since his plane was too damaged and too weighted down with rescued men to take off again, he and his crew passed the night fighting off sharks and caring for survivors while they waited for help to arrive. When the rescue operation was completed, only 317 men were pulled from the water alive. 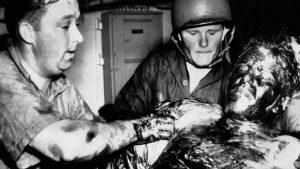 During the four days they spent in the water, almost 600 crewmembers had been eaten by sharks or died from their injuries, exposure, or thirst. It remains the worst disaster in U.S. naval history. As a nation, we were too busy being offended last week to commemorate the discovery of the Indianapolis seventy-two years after she sank. We’re too self-absorbed to grieve with the families of those men who gave their lives or acknowledge the relief they can now feel. Those men suffered horribly, but still felt pride in the country they fought to defend. Today, Americans burn the flag they fought to protect. We’re offended by words and traumatized by statues. Losing an election causes such agony that we skip work, cancel classes, and postpone exams. Our outrage at a jury’s errant acquittal justifies, we believe, burning neighborhoods and beating innocent bystanders for having the wrong skin color. We have lost, as a people and as individuals, any perspective but our own. Sadly, empathy is impossible without the ability to recognize and appreciate other perspectives, even when those perspectives are disagreeable or abhorrent. Civilization is impossible without empathy. It doesn’t take much perspective to figure out what comes next.